Expecting more rain today, possibly thunderstorms. As long as it doesn't pummel my garden that's okay, but I'm starting to feel like I live in Seattle instead of Chicago. 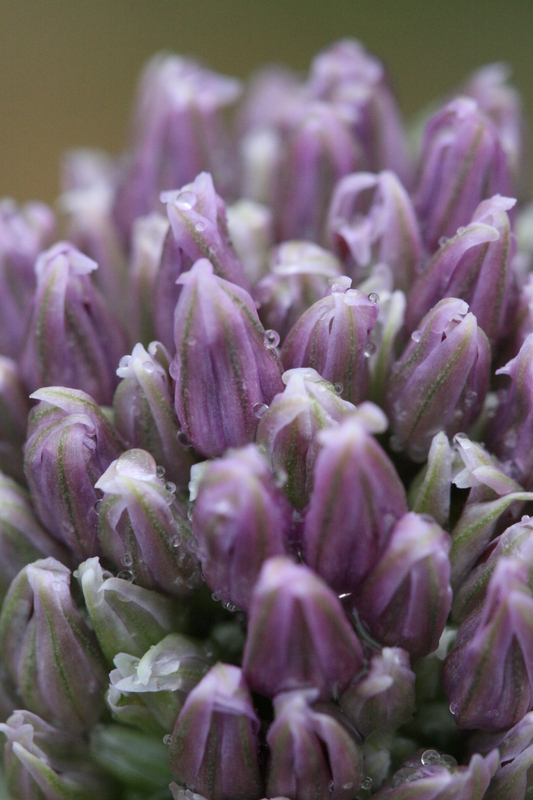 You can see how the Allium (?) has grown in one day. It's looking much more purple today, closer to bursting open. On a sort of related topic to rainy weather, I consider it miraculous I found a hair gel that controls the frizz my natural curls generate in rainy/humid weather. Well, I would, if my daughter hadn't stolen it from me and carried it off to her lair. Time to plan a counter-attack to re-gain the pressssshussssss. Yesssss…. Next Post Reading, reading and more reading. Current news from a bibliophile.